Funny photo frames - favorite photos on your desktop in a funny frame. Program is very easy to use . Once installed, the widget will automatically appear on your desktop. Drag it to any convenient place on your desktop. Press - to open the photo. Select a photo from your computer , in the format jpg, png or gif. Photos will appear in the program. 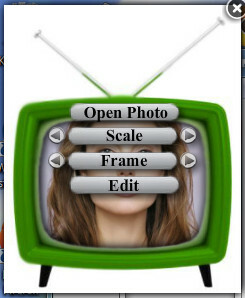 Then clicking on the arrow next to the button frame , leafing through photo frames, choose your favorite . You can add an inscription on the photo frame. For example - my love . Click on the text, a flashing cursor appears . Enter any text. You can choose the size of photo and picture frames . Press the arrows next to the button scale . Choose Your Size. The program automatically at startup windows. You can remove the program from startup . To do this, click Start - Startup delete icon funny photo frames. Program funny photo frames - will help you see the photos of your favorite not only on the table next to the computer , but also on the desktop of your computer screen .